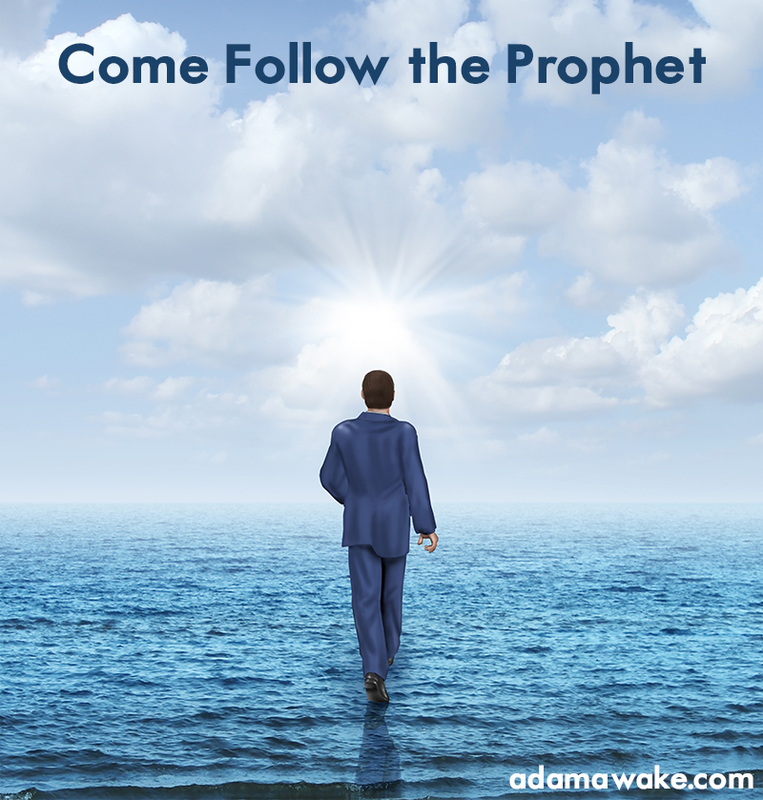 And he said unto the children of men: Follow the prophet. Wherefore, my beloved brethren, how can we follow the prophet save we shall be willing to keep the commandments of the church? And the prophet said: Repent ye, repent ye, and be baptized. And also, the voice of mine Apostles came unto me, saying: He that is baptized in my name, to him will the Melchizedek priesthood holders give the Holy Ghost; wherefore, follow the prophet, and do the things which ye have seen him do. Wherefore, my beloved brethren, I know that if ye shall follow the prophet, with full purpose of heart, acting no hypocrisy and no deception before the leaders of the church, but with real intent, repenting of your sins, witnessing unto the bishop that ye are willing to follow the prophet, and be baptized–yea, by following the prophet and others down into the water as they have done, according to his word, behold, then shall ye receive the Holy Ghost; yea, then cometh the baptism of fire and of the Holy Ghost; and then can ye speak with the tongue of angels, and shout praises unto the prophet of Israel. But, behold, my beloved brethren, thus came the voice of the prophet unto me, saying: After ye have repented of your sins, and witnessed unto the church that ye are willing to keep the commandments, rules, oaths and obligations, by the baptism of water and with your tithes and have received the baptism of fire and of the Holy Ghost, and can speak with a new tongue, yea, even with the tongue of angels, and after this should you deny the prophet, it would have been better for you that ye had not known me. And I heard the prophets voice, saying: Yea, the words of my Apostles are true and faithful. He that endureth to the end, the same shall be saved. And now, my beloved brethren, I know by this that unless a man shall endure to the end, in following the example of the prophet, he cannot be saved. Wherefore, do the things which I have told you I have seen that the prophet and Apostles should do; for, for this cause have they been shown unto me, that ye might know the gate by which ye should enter. For the gate by which ye should enter is repentance and baptism by water; and then cometh a remission of your sins by fire and by the Holy Ghost. And then are ye in this strait and narrow path which leads to eternal life; yea, ye have entered in by the gate; ye have done according to the commandments of the prophet and the church; and ye have received the Holy Ghost, which witnesses of the Prophet, Seer and Revelator, unto the fulfilling of the promise which they hath made, that if ye entered in by the way ye should receive. And now, my beloved brethren, after ye have gotten into this strait and narrow path, I would ask if all is done? Behold, I say unto you, Nay; for ye have not come thus far save it were by the word of the prophets with an unshaken faith in them, relying wholly upon the merits of these, my brethren. Wherefore, ye must press forward with a steadfastness in following the prophet, having a perfect brightness of hope, and a love for all men. Wherefore, if ye shall press forward, feasting upon the words of the prophet, and endure to the end, behold, thus saith the prophet: Ye shall have eternal life. And now, behold, my beloved brethren, this is the way; and there is none other way nor calling in or below heaven whereby man can be saved in the kingdom of God. And now, behold, this is the doctrine of the church, and the only and true doctrine of the church, and of the prophet, and of the Holy Ghost, Amen. Dude. Cajones de steel. I cannot get over how much this reminds me of Samuel the Lamanite. Preach it.